1. Mix rawa, maida, salt with enough water to form a thick dough. 2. Keep aside for half an hour closed with wet cloth. 3. Knead well again to make the dough soft and pliable. 4. Dry cashewnuts, melon seeds under hot sun for one hour. 5. Powder separately, and mix together with powdered sugar and cardamom powder. 6. Make small balls from the maida dough and roll it out into very thin chappathis. 7. Put it on top of a greased samosa mould. 8. Spread little filling on top, wet the edges and seal well. 9. Remove samosa from mould and deep fry in oil in reduced flame till crisp and golden. 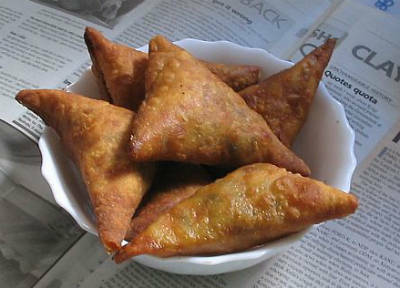 Feel free to comment or share your thoughts on this Sweet Samosa Recipe from Awesome Cuisine.